The earlier the better! Start looking for your bridal gown as soon as you know that you’re getting married. How long do dresses take to come in? Once ordered, bridal gowns can take up to 6 months to come in. On rare occasions, the company will have the dress in stock; if so, we can get the dress within 2-4 weeks. Can I purchase a dress that is in the store? Of course! With the majority of our bridal gowns, we allow for the bride to purchase one of our stock pieces. Yes! If you would like to purchase our stock piece, we ask for 30% of the purchase to be put down. If we have to order the bridal gown, we ask for 75% of the purchase to be put down. With both options, we provide a lay-away plan that allows you biweekly or monthly payments to pay for your gown entirely. Do you have each dress in different sizes? No. In order to showcase more designs, we generally only have that one sample piece. However, it can be ordered in a different size and possibly a different color. Do we have plus sizes in the store? Yes, our stock bridal gowns range from sizes 2 to 30. Why shouldn’t I buy my bridal gown from a website? Many websites are not authorized retailers and they steal images from the designer’s website; because of this, they don’t offer the correct product that they advertise. In addition, our experienced bridal consultants provide great customer service to our brides, ensuring that they get a wonderful bridal experience! How are these formal dresses sized? Typically, these dresses run small. It’s common for people to order 2 sizes bigger than what they may wear daily. How long does it take for these dresses to come in? If the company has the dress in stock, we can get the dress within 2 weeks from the date when the order was placed. If we have to special order the gowns, they can take between 6-8 weeks. Yes! If you would like to purchase our stock piece, we ask for 30% of the purchase to be put down. If we have to order the dress, we ask for 50% of the purchase to be put down. With both options, we provide a lay-away plan that allows you biweekly or monthly payments to pay for your dress entirely. Do we carry plus sizes? Yes, we have dresses in our store ranging from 00-30. Is there a clearance section? Definitely! 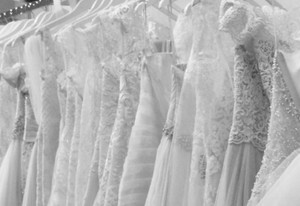 We have a whole section dedicated to discounted dresses to fit your special day! As the bride, we ask that you set an appointment to look at dresses. Once you have selected the style and color that you want your girls in, we will set up a Bridal Contract, Dress/Color Approval Form, and Party Registry Form. On the contract, we will set a deadline as to when all of your girls need to have their measurements and payments completed. These forms must be completed before your girls can start getting measured or paying for their dress. How long do these dresses take to come in to the store? Depending on the manufacturer, these dresses can take between 3-5 months to come in. However, rush ship options are available. If I have girls who are in my party but live out of town, can they still order through you? Of course! 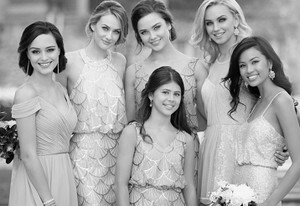 A consultant will email the bride/bridesmaid a Bridesmaid Contract. The girls will have to go to a local bridal store and get their measurements completed. They will email their contract with the size they would like us to order for them. Once we receive the contract, the girls can call and make their payment over the phone, or email/fax their payment using the Credit Card Authorization Form. Do you have plus size bridesmaid dresses to try on? -Yes! Can each dress come in different colors? Yes! We have swatches from all the companies, so we can show you the colors that the dresses come in. Do you have any Jr. Bridesmaid dresses in the store? Yes, we have a few sample pieces in the store. Do you have a wide selection of Mother’s gowns? Yes, Dimitra Designs takes pride in the amount of Mother of the Bride/Groom dresses we carry. We offer various sizes in the store ranging from 2-24. If provided with enough time, we can also order current styles in different sizes. As the groom, we ask that you set an appointment to look at various tuxedo options. Once you have selected the tuxedo and all the accessories, we will set up a Tuxedo Contract and Party Registry Form. On the contract, we will set a deadline as to when everyone in your party needs to have their measurements and payments completed. These forms must be completed before your party can start getting measured or paying for their rental. Do you service out of town guests? Yes! We ask for those who live out of town to get measured at their local tuxedo vendor and NOT by a tailor because they measure slightly differently. We will email a form to the groom/groomsmen and ask that it be filled out and emailed back to us with their proper measurements. We offer a few payment methods. You can call over the phone or email/fax a filled-out Credit Card Authorization Form. When will the rentals come in? Our tuxedo rentals come in the week of the event. Do you guys contact everyone in the party once the rentals come in? No, per the groom’s tuxedo contract, only the groom gets notified once the rentals have arrived. When do I have to return my tuxedo rental? All rentals are expected to be returned the following Monday after the event date (unless specified otherwise). You will be charged $25 for each day that the rental is late. Do you offer rentals in various fits and sizes? Yes, to both! Depending on the company and selected tuxedo, the company provides rental fit options from traditional, modern, slim, and ultra slim. Do you offer tuxedos for women? We do offer a tuxedo option for women; however, it is a purchase item, not a rental. How long do alterations take on dresses? It all depends on the alterations that need to be done and how busy we are. For simple alterations, they take 1-2 weeks; for more complex alterations, they can take between 2-4 weeks. Do I need an appointment for my alterations? Yes, we do ask that our customers have a set appointment time to get their dress altered. Do I need to bring specific things to my appointment besides my dress? Yes, we ask that you bring anything you plan on wearing that day such as your bra, spanx, shoes, etc. How far in advance should I set up an appointment? We generally ask for our brides to set up an appointment a month before their wedding. However, we suggest that it is best to set up an appointment during the time of purchase. Can I change my pick-up date to an earlier time? Unfortunately, not. Changing the pick-up date will cause delay and production time for other customers. Are you an authorized retailer? Yes, Dimitra Designs is an authorized retailer! You can go to the company’s website and our store will be listed as a vendor option. How do I know if a dress is in stock? All you have to do is call and ask! Simone will be happy to check and update you with information on dress availability. What are the ship times for online orders? Ship times depend on availability of the dress that you are interested in. Standard ship time is 1-2 weeks from the date that the order is placed. If more time is needed, you will be informed via phone or email. Are the dresses true to size? Each of the companies has their own size chart. The dresses are made according to those sizing charts. Do I have to include my measurements? Yes, your order can be delayed if your measurements are not provided at the time that the order is placed. I have my measurements, but how do I know what size to order? We suggest that you look at the style of dress and the most important measurement. After reviewing that, we ask that you refer to the size chart that the company provides to select your appropriate size. However, if you have any issues, feel free to call and ask for help! What is a hollow-to-hem measurement? This is the measurement from the space between the collar bones all the way to the floor, right in front of the feet. (Refer to our measuring video for proper instructions). What is most important when ordering a dress for a child? Typically, you want to focus on the hollow-to-hem measurement. However, if the bust and waist measurements exceed the recommended size for their hollow-to-hem measurement by 1-2 inches, focus on that size.